Cancer is a term used for not one but many diseases. 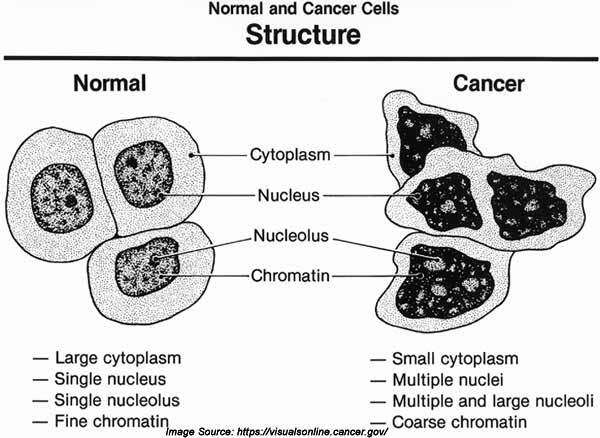 When one experiences abnormal cell division without control, it is considered to be a type of cancer. Most cancers are named for the organ or type of cell in which they start. Cancer cells sometimes spread to other tissues and organs via the bloodstream and lymph system. When the DNA of a cell is damaged or changed, it affects normal cell growth and division. When this happens, cells do not die to allow space for new cells to form. The extra cells often form a mass of tissue called a tumor; however this is not always true. 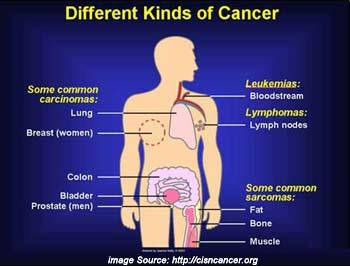 Certain cancers such as leukemia do not form tumors. Treatment of cancer works best when it is found early. People often ignore the signs and symptoms because they can seem unimportant or more likely caused by something other than cancer. Other times they fear what the symptoms could mean, so they don’t seek medical help. 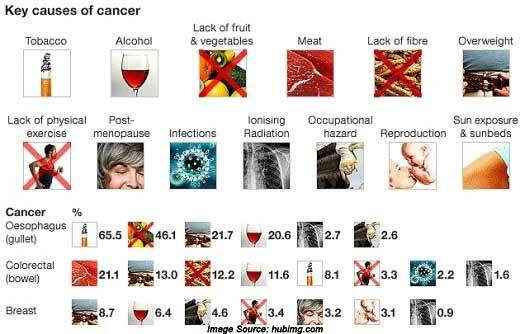 It is imported to know some general signs and symptoms of cancer. If any of these symptoms last for a long time or get worse, it is important to seek medical attention. This is because people who are diagnosed early are more likely to recover. Unexplained weight loss of 10 or more pounds may be the first sign of cancer. This symptom is often related to cancers of the pancreas, stomach, or lungs. Stomach or colon cancers can cause blood loss that isn’t obvious which leads to extreme tiredness despite getting proper rest. Fatigue can also be associated with some cancers like leukemia. A headache that does not go away or get better with treatment can be a symptom of a brain tumor. These symptoms are usually among the first signs of cancer. Other signs and symptoms aren’t always as obvious so they go unexamined, which can lead to further progress and lessen the chances of survival. 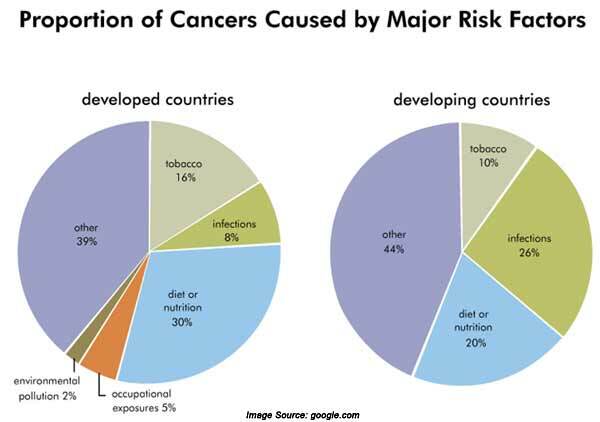 Anything that increases your chances of developing cancer is called a cancer risk factor. Some risk factors such as smoking can be avoided. However, others such as genetic risk factors are inherited from our parents. 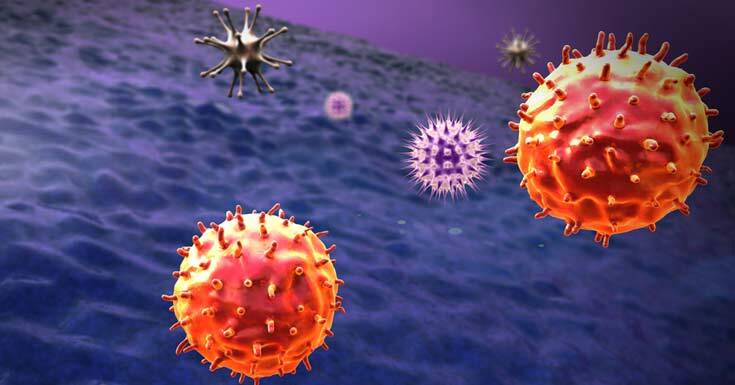 Infections such as HPV (Human papillomavirus), Hepatitis B, and Hepatitis C are also factors known to increase the risk of developing cancer. Viruses and other infections that cause cancer are more prevalent in developing countries where 1 of 4 cases can be linked to infections. Contrast this with developed countries where only 1 of 10 cases can be linked to viruses and infection. Radiation is also considered to be a cancer risk factor. The first type is the ultraviolet radiation that comes from sunlight. Also known as UV radiation these invisible UVA and UVB rays are part of the sun’s energy. Because UV radiation is the main cause of non-melanoma skin cancers doctors, recommend that people use sunscreen when outdoors for prolonged periods. Another type of radiation is ionizing radiation; this type of radiation is associated with x-ray, CT scans, and radio imaging scans. This class of radiation can be linked to thyroid and breast cancer in women. Being exposed to radiation from diagnostic x-ray also increases the risk of leukemia and cancers of the lung, colon, esophagus, and stomach. 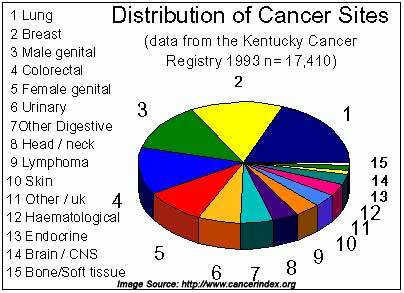 According to the National Cancer Institute, there are over 100 types of cancer. The most common types include lung, breast, and prostate cancer. These 3 alone account for an estimated 689,000 new cases every year. Sarcoma is a cancer that develops in the bone, muscle, cartilage. Leukemia starts in blood-forming tissue such as bone marrow. It causes abnormal blood cells to develop and enter the blood stream. Lymphoma attacks the cells of the immune system. And as the name implies central nervous system cancers attack the tissues of the brain and spinal cord. When choosing the appropriate diagnostic test, doctors must consider a person’s age and medical condition as well as the type of cancer suspected. As with most diseases today there is a wide array of test available. The most common diagnostic methods for cancer include biopsies and diagnostic images. A biopsy is the medical removal of tissue from a patient to determine the presence of cancer cells. Once the sample is collected, it is examined by a specialist using powerful microscopes. Depending on the location, biopsies can be done on an outpatient basis. A biopsy is the only way to make a definitive diagnosis as it provides the most accurate analysis of tissue. Diagnostic imaging uses several advanced techniques to produce photographs of internal body parts. These photos are reviewed by doctors who look for abnormal areas that may indicate the presence of cancer. X-rays, CAT scans, MRI’s and Ultrasound are all technologies that are most often used for these images. Blood test look for substances called tumor markers that are released by tumors. If an oncologist does a blood test of prostate cancer, he looks for a tumor marker called prostate specific antigen or PSA. Doctors look for higher than normal amounts of PSA levels which can often be an indication of prostate cancer. These same techniques also work for other types of cancerous tumors that release these markers. 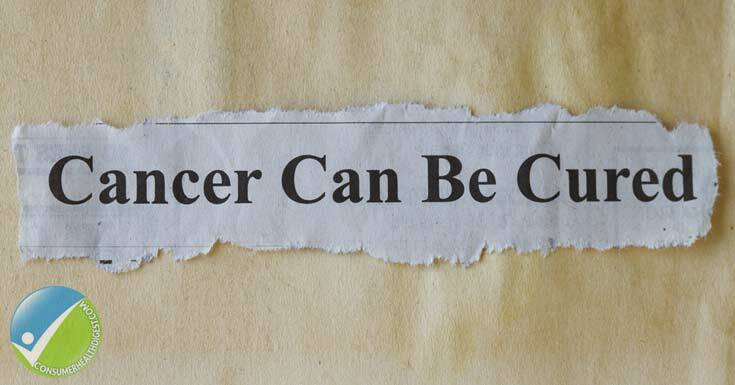 Accurate identification of cancer allows doctors to choose the most effective treatment. In cancer care, many different types of treatments and medications are available. Most of the time, a team of medical professionals work together to create the patient’s overall treatment plan. It is not uncommon for the team to combine different types of treatment, for example, a stem cell transplant may be performed after chemotherapy. A stem cell transplant, also known as a bone marrow transplant is the injection of healthy stem cells into your body to replace damaged or diseased cells. As mentioned previously it is not uncommon to see this procedure coupled with chemotherapy when treating leukemia, lymphoma or myeloma. Chemotherapy treatment uses powerful medications that circulate in the bloodstream and directly damage the cells that are actively growing. Cancer cells are more susceptible to the actions of these drugs because they normally grow and divide at faster rates than healthy cells. Many of the traditional chemotherapy drugs are given intravenously. However, other methods such as pills, capsules, and topical forms are also used. Most people with cancer will undergo some surgical procedure. If the cancer has not spread to other parts of the body, surgery usually offers the greatest chance of eliminating the disease. A doctor may choose to perform prophylactic surgery when a certain body tissue is likely to become cancerous. For example, precancerous polyps are often removed from the colon during a colonoscopy. Curative surgery is the preferred method when cancer is found in only one area of the body. With this method, all of the cancer can be removed. However, another method called debulking surgery is preferred when removing the entire tumor would cause too much damage to nearby organs or tissues. In this case, the doctor will take out as much as possible then treat what’s left with radiation, chemotherapy or other methods. It is expected that by 2030, the majority of deaths in the world will be related to cancer. While there is no surefire way to avoid the disease there are many things one can do to lessen the chances of developing it. Doctors recommend choosing the right diet. Studies show that fruits and no starchy vegetables protect against certain cancers such as those in the stomach and lungs. Alcohol should use very sparingly; drinking is linked to an increased risk of oral cancer, breast cancer, and liver cancer. Along with the proper diet, doctors recommend living an active lifestyle. Obesity is linked to a higher risk of kidney and pancreatic cancer. However, doctors realize that people who are more physically active have a lower risk than those who are not. Clinical studies show a strong link between physical activity and a lower risk of certain cancers. Related Video: 3D Medical Animation – What is Cancer?